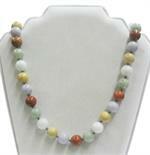 Item #BE-585: 20" necklace of 9mm round natural multi-color Jadeite beads with 14Kt. Yellow Gold fish hook clasp. Item #BE-583: 17" necklace of 8mm round natural multi-color Jadeite beads with 14Kt. Yellow Gold fluted rondels and fish hook clasp. 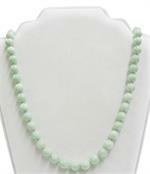 Item #MK-313203: 19" necklace of 9mm round natural Green Jadeite beads with 14Kt. Yellow Gold slide clasp and safety. 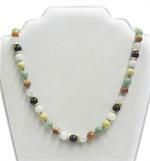 Item #BE-584: 19" necklace of 12mm round natural multi-color Jadeite beads with 14Kt. Yellow Gold slide clasp & safety. Item #BE-542: 26" necklace of 8mm round natural Black Burmese & Red Jadeite beads, 2.5" carved Red Jadeite centerpiece with birds & flowers and 14Kt. Yellow Gold fish hook clasp. Item #SC-ERBJ-0029: 14Kt. Yellow Gold earrings with 9mm round Antique Dark Green Jadeite discs, round Diamonds of .02 Cts. TW and post backs. Item #SC-ERBJ-0040: 18Kt. Yellow Gold earrings with 5x6mm oval Green Burmese Jadeite cabs, eight baguette Diamonds of .14 Cts. TW and post backs. Item #SC-PTBJ-0759-X1: 18Kt. White Gold pendant with carved Burmese Jadeite fruit, one round Diamond of .08 Cts. and nine tapered baquette Diamonds of .19 Cts. TW. Item #CBJ-27: 2 3/16" 14Kt. Yellow Gold pendant enhancer with carved light Lavender with Yellow and light Green Burmese Jadeite Kwan Yin (Goddess of Mercy) of 30.15 grams TW. Item #CBJ-147: 2" x1 1/4" 14Kt. Yellow Gold pendant with carved orange & white Burmese Jadeite Kwan Yin (Goddess of Mercy) of 14.77 grams TW. Item #SC-ERRJ-0014: 14Kt. Yellow Gold earrings with Chinese script posts, 8x16mm Burmese Red Jadeite drops and post backs. Item #CJ-1707: 1 1/2" tall carved white, yellow & green double sided Burmese Jadeite vase pendant with intercarved Jadeite bail of 17.07 grams TW. 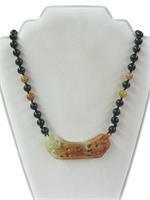 FREE 18" silk cord accompanies pendant. 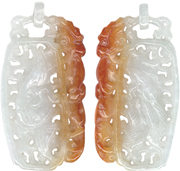 Item #J-420: 1 1/8"x2 1/4" carved green and white Jadeite dragon pendant with Chinese script and 14Kt. Yellow Gold Bail of 17.37 grams TW. Item #NS-253: 5/8" x1 3/4" carved yellowish green and brown double sided Burmese Jadeite "Ear of Corn" pendant with 14Kt. Yellow Gold bail of 29.23 grams TW. Item #J-2: 1 5/8" carved lavender and yellow double sided Burmese Jadeite vase pendant with intercarved Jadeite Bail of 15.08 grams TW. FREE 18" silk cord accompanies pendant. Item #D&R-15150: 2.75"x2" carved green and lavender Burmese Jadeite dragon and phoenix pendant with two 14Kt. Yellow Gold enhancer bails with forty-two Round Diamonds of .44 Cts. TW in White Gold. Item #D&R-18093: 14Kt. Yellow Gold pendant with 5/8"x1 1/2" medium mottled Green carved Burmese Jadeite Kwan Yin. 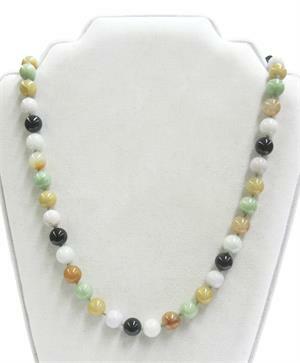 Item #LR-13836: Lady's 14Kt. Yellow Gold Pendant with .5"x1.5" tall carved medium light Green Burmese Jadeite Kwan Yin. Item #JP-3205: 1 1/2"x1 3/4" tall carved Lavender and Green Burmese Jadeite pendant engraved with Chinese Symbols with 14Kt. Yellow Gold bail of 32.05 grams TW. Item #CJ-1727: 29x53mm Carved Multi-Color Burmese Jadeite Pendant with Phoenix and Ancient Chinese Creature; Jadeite Bail; 17.27 grams. 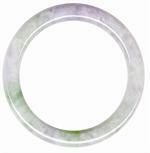 Item #8H: 9mm solid Burmese green and lavender Jadeite bangle bracelet with 57.5mm" inside diameter. 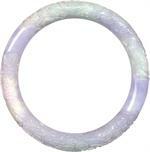 Item #CSJ-2685: 9.5mm solid Burmese green and lavender Jadeite bangle bracelet with 2 1/2" inside diameter. 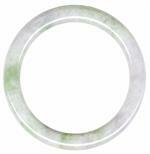 Item #CBJB-2: 11mm wide solid carved light green and medium lavender Burmese Jadeite bangle with 2.25" inside diameter. Item #D&R-15684: 14Kt. Yellow Gold pendant with carved .75"x1.5" light green and lavender Burmese Jadeite Kwan Yin (Goddess of Mercy) of 11.32 grams. Item #FP-259: .5"x1.63" 14Kt. Yellow Gold brooch / pendant with carved green and white Burmese Jadeite and nine round Diamonds of .22 Cts. TW. Item #CSJ-7489: 9mm wide solid greeen and medium light mustard yellow Burmese Jadeite bangle with 2.25" inside diameter. Item #CSJ-7490: 9.5mm wide solid medium green and medium mustard yellow Burmese Jadeite bangle with 2.38" inside diameter. 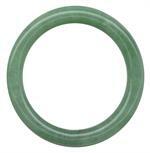 Item #CSJ-2683: 8.5mm solid green Burmese Jadeite bangle bracelet with 2 1/8" inside diameter. Item #LR-13835: 14Kt. Yellow Gold earrings with 6mm round and 8x11mm oval Green Burmese Jadeite cabsround Diamonds of .07 Cts. TW and post backs. Item #D&R-31484: 1"x1.5" 14Kt. Yellow Gold cross pendant with green Burmese Jadeite. Item #CSJ-1398: 18Kt. Yellow Gold earrings with 7x9mm pear shape green Burmese Jadeite cabs and post backs. 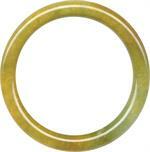 Item #LR-13838: .75"x2" 14Kt. 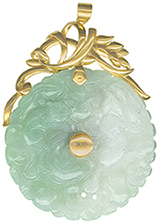 Yellow Gold pendant with medium green Burmese Jadeite Kwan Yin. Item #D&R-13839: 14Kt. Yellow Gold pendant with .63"x1.63" carved, light green Burmese Jadeite Kwan Yin (Goddess of Mercy) with dark green mottling of 7.98 grams TW. Item #D&R-18095: 14Kt. Yellow Gold pendant with .5"x1.38" carved, medium mottled green Burmese Jadeite Kwan Yin (Goddess of Mercy) of 5.80 grams TW. Item #LR-FP961: 14Kt. Yellow Gold pendant with 6.5x45mm green Burmese Jadeite cylinder. 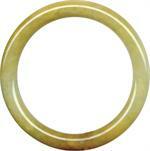 Item #CSJ-7488: 9mm wide solid sreen Burmese Jadeite bangle with 2.19" inside diameter. Item #15418: 14Kt. Yellow Gold ring with six 5x7mm oval green Burmese Jadeite cabs and three round Diamonds of .18 Cts. TW set in White Gold. Size 6 3/4. Item #CSJ-7475: 14Kt. Yellow Gold pendant with 5x15mm oval green Burmese Jadeite cab. Item #CSJ-7476: 14Kt. Yellow Gold pendant with 5x15mm oval green Burmese Jadeite cab. Item #D&R-21794: 18Kt. White Gold cross pendant with two 3x4mm and one 3x16mm rectangle green Burmese Jadeite cabs and seven round Diamonds of .12 Cts. TW. Item #D&R-31485: 1"x1.5" 14Kt. Yellow Gold cross pendant with green Burmese Jadeite and round Diamond of .05 Cts. set in White Gold. 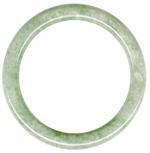 Item #LR-FE-2950: .75" round 14Kt. Yellow Gold earrings with 15mm round green Burmese Jadeite donuts, round Diamonds of .08 Cts. TW set in White Gold and post & clip backs. Item #D&R-21802: 18Kt. White Gold pendant with 14mm round natural green Burmese Jadeite donut, fifteen tapered baguette Diamonds of .13 Cts. TW and ten round Diamonds of .12 Cts. TW. Item #CSJ-7477: 14Kt. Yellow Gold pendant with 7x15mm dark green Burmese Jadeite drop. Item #17157: 18Kt. White Gold ring with 8.6x12mm oval lavender Jadeite cab and eighteen round Diamonds of .09 Cts. TW. Size 6 1/4. Item #LR-12142: 14Kt. 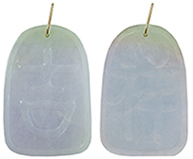 Yellow Gold earrings with Chinese script posts, 8x20mm lavender Jadeite drops and post backs. Item #CSJ-7394: 3 11/16" 14Kt. Yellow Gold pendant enhancer with carved lavender Jadeite Kwan Yin and forty-seven round Diamonds of .44 Cts. TW set in White Gold. Item #CBJ-23: 14Kt. Yellow Gold pendant enhancer with 48x33mm carved, mottled lavender Burmese Jadeite Kwan Yin (Goddess of Mercy) of 24.89 grams TW. Item #SC-ERMJ-0094: 14Kt. Yellow Gold earrings with two each 4x6mm oval white, black, green, rust red and yellow Burmese Jadeite cabs and post backs. Item #JM-899-RJ: 14Kt. Yellow Gold earrings with 15mm round red Burmese Jadeite cabs and post & clip backs.